Oct. 21, 2010 (EIRNS)—Executive Intelligence Review is pleased to announce that the underground best-seller, Dope, Inc., first published by the LaRouche political movement in 1978, is back in print. 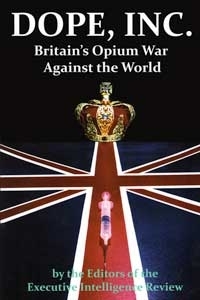 The 320 page paperback, subtitled “Britain’s Opium War Against the World,” includes reprints from the 1992 third edition, and indepth studies from Executive Intelligence Review magazine, analyzing the scope and size of the international illegal drug-trafficking empire known as Dope, Inc.
Dope, Inc. was commissioned by Lyndon LaRouche, who laid out a war strategy against these London-based death merchants that would work, a war strategy that got considerable traction in the early 1980s. Appropriately, this new edition begins with LaRouche’s 1985 proposed multinational strategy against the drug-traffic in the Western hemisphere, presented in Mexico city in 1985, but never implemented. It also reviews Dope, Inc.’s expansion, including the drug wars being waged out of Afghanistan, and against Russia and Europe today. This book represents a crucial weapon against the British Empire today, which uses its dope money to support its bankrupt financial system, and to stupefy and degrade populations worldwide. This edition, published by Progressive Independent Media, is currently available in limited numbers, so there is no time to waste in buying yours today. The cost is $25 per book, with $4 for shipping and handling. It is available through store.larouchepub.com, and EIR’s national office, at 1-703-297-8434.